Customers awaiting packages in suburban Washington state may get a surprise — and a laugh — when their deliveries arise. Rather than using a box truck or a carrier on foot, the world’s largest Internet company by revenue is testing an autonomous delivery device the size of a small cooler that rolls along sidewalks at a walking pace. 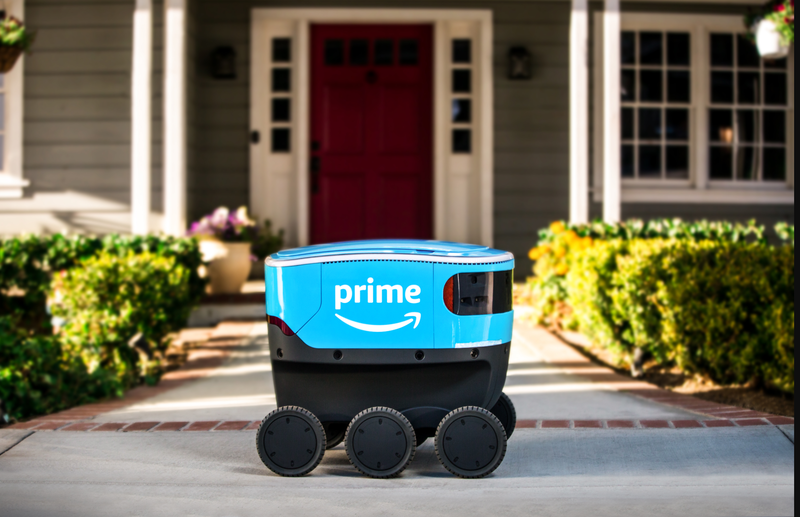 The new, fully electric delivery system – Amazon Scout – has been designed to get packages to customers safely using autonomous delivery. Customers in a neighborhood in Snohomish County, Washington, were the first to see the service. While Snohomish County customers order just as they normally would, their Amazon packages will be delivered either by either Amazon Scout or a regular partner carrier. At the beginning, the 6 devices will deliver packages Monday through Friday during daylight hours — accompanied by an Amazon employee. Scout navigates to the customer’s door and automatically opens a top hatch, allowing the customer to retrieve the package. Amazon Scout was created at the company’s research and development lab in Seattle. Safety goals included ensuring the devices could efficiently navigate around pets, pedestrians, and other obstacles in the path. Amazon is only one of many companies quickly entering the autonomous delivery market. Below are some others, and they’re really fun. Do you remember the local greengrocer, milk carrier, or ice-cream vendor coming door to door to deliver yummy regional food products? A team with “deep domain expertise in on-demand delivery, retail operations, and autonomous vehicles” seems to have just these memories, as they’ve leveraged driverless technology so that home food delivery makes financial sense to scale. The company refers to the Robomart humbly as the “world’s most accessible grocery store.” Consumers tap a button to request the closest available vehicle, which is small and streamlined. Once it arrives, the van doors unlock, and consumers pick the products they want. Robomart tracks what customers have taken using patent pending “grab and go” checkout-free technology, charges them, and sends a receipt accordingly. Then the Robomart moves back out onto the road and heads to another waiting consumer. The company is deploying its initial fleet in 2019 commercial pilots with their first customer, Stop & Shop. Robomart’s ownership group is seeking additional retail partners to expand their business model. Having a small city of early adopters seemed to be the perfect fit for autonomous food service delivery at George Mason University in Fairfax, Virginia. Students who want a late-night coffee or meal can order food from on-campus retailers — including a grocery store and the local Starbucks — and will get their order delivered by one of 25 delivery robots. Students drop a pin on an app’s map to show where they want to get the delivery. Within 15 minutes or less, one of the tiny robots, which can each carry up to 20 pounds, will bring them the food. When the robot arrives, the student uses the app to unlock it. Starship Technologies, which was launched in 2014 by the same folks who brought you Skype, believes their robots will revolutionize neighborhood deliveries. They envision a world in which the little electric robots can replace cars for many deliveries in cities everywhere, helping cut traffic and pollution. Under the supervision of humans who follow in a car, Nuro autonomous delivery is, essentially, a small box on wheels with a maximum speed of 25 miles per hour. The Mountain View company is testing grocery delivery with 2 of these small vehicles to residents in south Scottsdale’s 85257 ZIP code. That’s right — it’s another Silicon Valley company testing in Arizona. With more than 1,000 deliveries under their proverbial belt since August, Nuro has established a record of consistency and security. At the beginning, Nuro delivered using autonomous Prius cars which had a human driver inside. 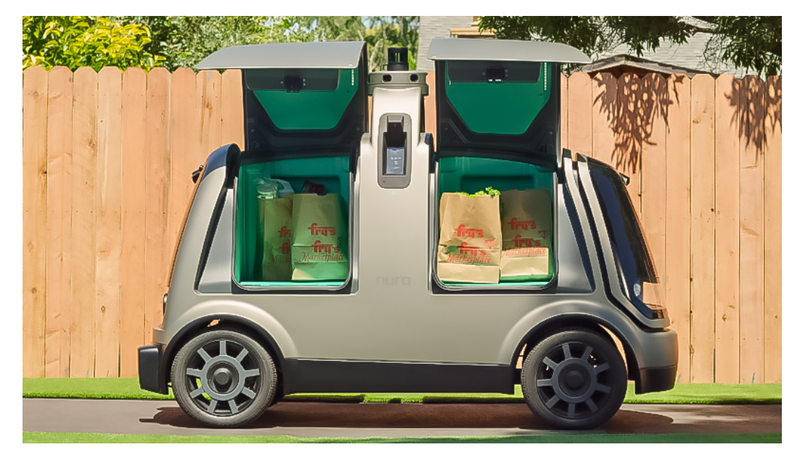 Over the last month, Nuro has used the newer autonomous delivery vehicles 13 hours a day every day of the week. The service is part of a partnership with Kroger. The Nuro vehicles navigate traffic by reading a variety of sensors, similar to other autonomous vehicles being tested in Arizona. What’s different with the Nuro vehicles, however, is they have no driver within the vehicle who can leap to take control, should a situation arise that is beyond the autonomous vehicle’s programming. The vehicles only travel on side streets to get to their destination to ensure safety, said Clare, a former Tesla employee. He added that the Scottsdale location was chosen over others for the testing due to its moderate climate and because individuals in the area have prior experience with driverless technology, due to other companies testing here. Residents within Nuro’s target area can access the autonomous delivery by logging onto the Fry’s website. They choose “7770 E. McDowell Road,” indicate their own address for delivery i.d., and click on their items. Scottsdale is the only place Nuro is testing its vehicles outside of Mountain View, where Nuro is headquartered. Like so many other tech entrepreneurs these days, the Nuro founders hopped from one tech company to another — in this case, from Waymo (a Google/ Alphabet affiliate testing driverless vehicles in Arizona and elsewhere) to their own gig.